Mix a standard application of a balanced organic fertiliser into the soil prior to planting along with a generous helping of well-rotted compost. Fertilise established petunias monthly from midsummer to autumn. The most vigorous petunias like to sprawl, so they make great foreground plants for upright neighbors like sunflowers or zinnias. They also make excellent flowers for mixed containers. Many excellent petunia varieties can be grown from seed, or you can start with plants grown from rooted cuttings. Petunia seeds are small but easy to handle. The seedlings need bright light to grow well. Most gardeners buy petunias as inexpensive bedding plants, set out in spring as soon as danger of frost has passed. Large varieties may need wider spacing, or you can grow them in 35cm (14-inch) diameter containers. 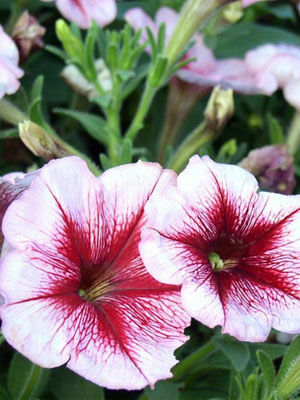 Petunias come in many colours and bicolours, and some varieties have frilly double blossoms. The more petals in a petunia blossom, the more likely it is to become heavy with rain and smash to the ground. Petunias bloom longer and stronger when old blossoms and seed capsules are snipped off every week or so. Few pests bother petunias, which are members of the nightshade family. Mites, leaf miners and budworms cause occasional problems.